Access control systems are the perfect way to limit an individual's ability to enter a certain area or property, without restricting accessibility and flexibility for those with granted access. Some of our most popular solutions in this area, are our key fob security systems, which can be used to provide adaptable security to homes and businesses. Reduces the need for manned security systems. Can be easily expanded and adapted according to demand. Reduces disruption/disturbances for homes and businesses. Providing easy access to homes and apartments, while minimising public access to communal areas. Preventing members of the public from entering private or secure spaces in commercial buildings. Implementing a staff hierarchy and security structure, by controlling or limiting the accessibility of certain areas. Here at IDS, we have years of experience in proving door entry solutions for a range of commercial and residential clients of all sizes, working to deliver tailored systems using the latest technology, from leading UK and European manufacturers. Each project is treated with great care and attention to detail from start to finish, in order to provide each client with a secure, user-friendly system, which has been adapted to fit their exact needs. 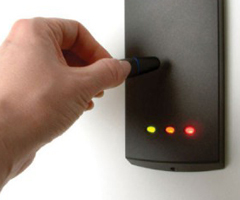 Want to find out more about key fob access control systems?